Mfc100u.dll errors are caused by situations that lead to the removal or corruption of the mfc100u DLL file, an important part of the Visual C++ runtime library supplied by Microsoft. This application failed to start because mfc100u.dll was not found. Re-installing the application may fix this problem. The file mfc100u.dll is missing. Cannot start [APPLICATION]. A required component is missing: mfc100u.dll. Please install [APPLICATION] again. 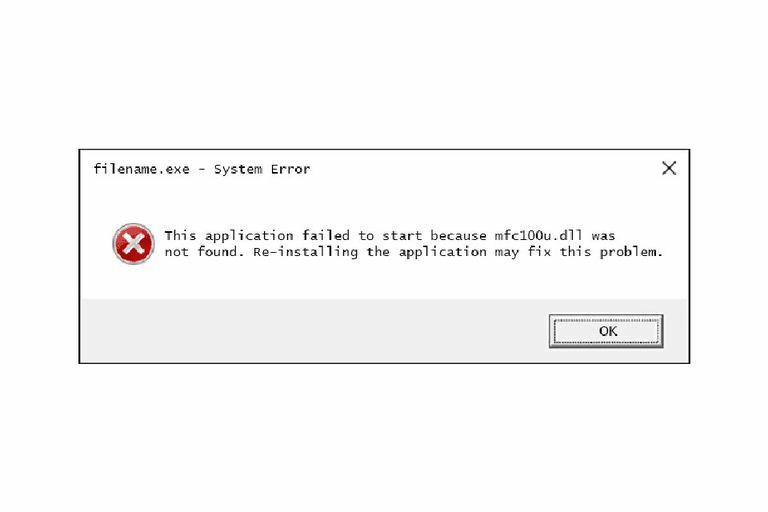 Mfc100u.dll error messages might appear while using or installing certain programs, when Windows starts or shuts down, or maybe even during a Windows installation. In some cases, mfc100u.dll errors could indicate a registry problem, a virus or malware issue, or even a hardware failure, but those possibilities are unlikely. The mfc100u.dll error message could apply to any program or system that might utilize the file on any of Microsoft's operating systems. This includes Windows 10, Windows 8, Windows 7, Windows Vista, Windows XP, and Windows 2000. Do not download mfc100u.dll from a "DLL download" website. There are many reasons why downloading a DLL file is a bad idea. If you need a copy of mfc100u.dll, it's best to obtain it from its original, legitimate source. Start Windows in Safe Mode to complete any of the following steps if you're unable to access Windows normally due to the mfc100u.dll error. Download the Microsoft Visual C++ 2010 Service Pack 1 Redistributable Package MFC Security Update and run it. This will replace/restore the mfc100u.dll with the most recent copy provided by Microsoft. You're given several download options from Microsoft for this update, based on the version of Windows you have installed—x86 (32-bit) or x64 (64-bit). See Am I Running a 32-bit or 64-bit Version of Windows? for help if you're not sure what to choose. Try your best to complete this step. Applying this update is almost always the solution to mfc100u.dll errors. Install any available Windows updates. Many service packs and other patches replace or update some of the hundreds of Microsoft distributed DLL files on your computer. The mfc100u.dll file could be included in one of those updates. Update Windows even if you know the mfc100u.dll file isn't going to be installed with one of the updates. It's possible that a specific update is necessary before the mfc100u DLL file can work properly. In other words, this DLL file might be dependent on another file or set of files that could be included in a Windows update. Restore mfc100u.dll from the Recycle Bin. The easiest possible cause of a "missing" mfc100u.dll file is that you've mistakenly deleted it. Run a virus/malware scan of your entire system. Some mfc100u.dll errors could be related to a virus or other malware infection on your computer that has damaged the DLL file. It's even possible that the mfc100u.dll error you're seeing is related to a hostile program that's masquerading as the file. If you find that the DLL file is really a virus or some other malicious program, or was installed along with malware and shouldn't be on your computer, I highly recommend installing an always-on, antivirus program to catch threats like this before they can cause any damage. There are plenty of free AV programs available for Windows. Shut down or uninstall the program that's causing the DLL error. Sometimes, a program will run an unwanted or unnecessary background process that gives this mfc100u DLL error. For example, Sony's VAIO Update software might run update procedures in the background and inadvertently cause "VUDesktopToast.exe - System Error" related mfc100u.dll errors. Removing the update tool might resolve the issue. This step should be followed only if you don't necessarily need the program. If you'd rather keep the program, consider reinstalling the software instead. Use System Restore to undo recent system changes. If you suspect that the mfc100u.dll error was caused by a change made to an important file or configuration, a System Restore could solve the problem. Test your computer's memory and then test the hard drive. I've left the majority of hardware troubleshooting to the last step, but your computer's memory and hard drive are easy to test and are the most likely components that might cause mfc100u.dll errors as they fail. If the hardware fails any of your tests, replace the memory or replace the hard drive as soon as you can. Repair your installation of Windows. If the individual mfc100u.dll file troubleshooting advice above is unsuccessful, performing a startup repair or repair installation should restore all Windows DLL files to their working versions. Use a free registry cleaner to repair mfc100u.dll related issues in the registry. A free registry cleaner program may be able to help by removing invalid mfc100u.dll registry entries that might be causing the DLL error. Perform a clean installation of Windows. A clean install of Windows will erase everything from the hard drive and install a fresh copy of Windows. If none of the steps above correct the mfc100u.dll error, this should be your next course of action. All the information on your hard drive will be erased during a clean install. Make sure you've made the best attempt possible to fix the mfc100u.dll error using a troubleshooting step prior to this one. Troubleshoot for a hardware problem if any mfc100u.dll errors persist. After a clean install of Windows, your DLL problem can only be hardware related.